This October, the Patti Smith Group's controversial second album, Radio Ethiopia, marks its 40th anniversary. Sandwiched between her supernova debut, 1975's Horses, and 1978's epic Easter, Radio Ethiopia is often a footnote in any discussion of Smith's eleven studio albums to date; she was critically pilloried upon its release. To add injury to insult, her tour supporting the album was marred by a serious on-and-then-offstage injury in 1977 when Smith fell 15 feet into an orchestra pit while performing, breaking vertebrae in her neck. So Radio Ethiopia is a ferocious footnote and one that points to the singer, songwriter, poet, and visual artist's grit, tempestuous nature, steely demeanor, and unpredictable trajectory. The critics who blithely trashed the 29-year-old Smith in 1976 could have never imagined that by the cusp of her 70th birthday this December, she'd not only be a National Book Award winner for her 2010 memoir Just Kids, a Polar Music Prize recipient, and a Rock and Roll Hall of Fame member, but revered as one of New York's great cultural icons. Smith is a survivor, buoyed by devoted fans who hear and see themselves in her jagged poetry, provocative observations, and anguished howls. This poetic pugilist and rock 'n' roll revolutionary, born in Chicago and raised in Philly and South Jersey, has always had a profound understanding of American fury—and tenderness too. Admittedly, few artists could declare "People Have the Power," as Smith did on 1988's Dream of Life, and not be accused of sentimentality or being downright corny: the song still resonates nearly thirty years later. More poignantly, she wistfully rues the loss of the New York where she developed her "cultural voice" too, and has often questioned whether the city even welcomes artists anymore. Smith's youthful snarl, bravado, and fearless attitude defined punk in its purest form back in the mid-Seventies and aspects of that broken-glass persona still lingers: her sharp epée of a tongue has bloodied (or amused) many a radio host, TV presenter, and music journalist attempting to interview her over the decades. Yet she has eagerly accrued many famous friends over the years too, like Michael Stipe, U2, and one of her heroes, Bob Dylan (she did an especially resonant cover of Dylan's "Boots of Spanish Leather" at the Newport Folk Festival in the summer of 2016). Her own influence is indisputable in music that spans the past forty years: you can hear Smith's impact on artists ranging from Nirvana to PJ Harvey to the Smiths (yes, a 14-year-old Johnny Marr first met Morrissey at a Patti Smith gig). In 2016, Smith is as active as ever, on tour this fall with a big gig at the Hollywood Bowl in Los Angeles on October 23 with Bon Iver and Hiss Golden Messenger. In New York, she's slated for a forthcoming "Brooklyn By The Book" event at Congregation Beth Elohim on September 15 focusing on her meditative 2015 memoir M Train, which dwells on her late husband Fred "Sonic" Smith and the writer's process. M Train is available in paperback from Penguin Random House on August 23. Smith has shouldered a lot of taglines, from the "godmother of punk" to the "poet laureate of New York." 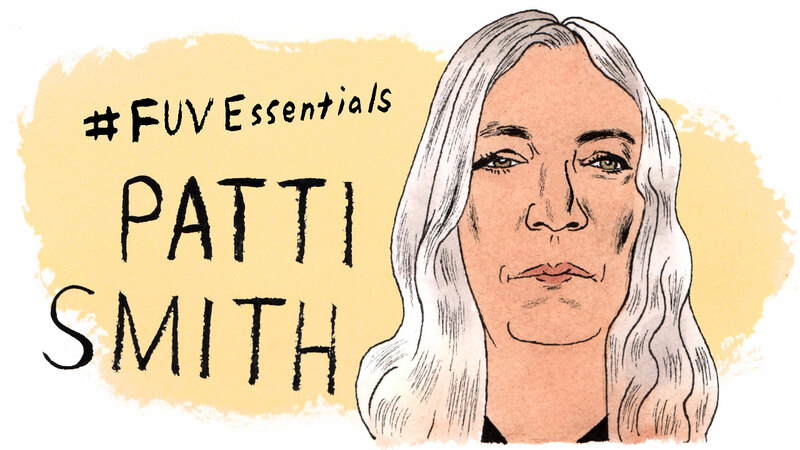 We're going to bestow another one on her mighty shoulders—Patti Smith is definitely one of our FUV Essentials artists.